It follows the Executive Order issued by President Donald Trump, with the imprimatur of 62 million voters, to protect the nation from foreign terrorists entering into the United States. Two states objected to the president's undeniably badly written Order, which, while upholding negative rights—and neither denying natural rights nor minting positive ones—was nevertheless replete with administrative errors. If you’re good at what you do, you look to make it in the private sector (as our president did, before he did us a favor). If not, you seek sheltered employment (as President Trump’s predecessor did). Clearly, clerking for the Supreme Court, as August Flentje had done, doesn’t mean a whole lot. In presenting the oral arguments for the president and the people, Flentje evinced a level of incompetence that spurred the Bench to the heights of usurpation. 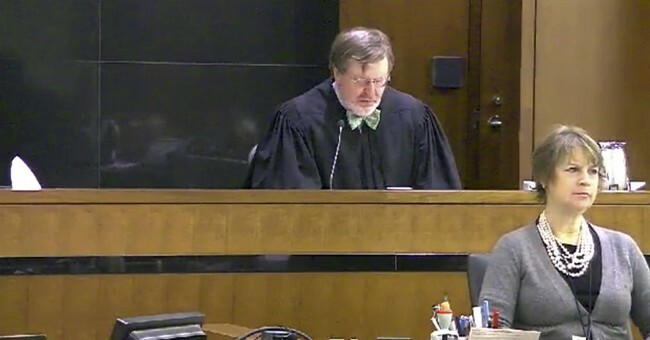 For example, when The Court caviled about an alleged lack of evidence for the necessity of the “travel ban,” not only did Flentje fail to provide it, but he failed to question the need for this evidence, based on the scope of the president’s constitutional, executive power in matters of national security. Those on the Right who opposed George Bush during his presidency (check) were vindicated yet again. In the nooks-and-crannies of our command-and-control judiciary, Bush had squirreled away a jurist as bad as John G. Roberts Jr. The unelected Bush appointee under discussion is from my State of Washington. District Judge James L. Robart, like Bush, would wrestle a crocodile for an illegal immigrant, or for potential immigrants, preferably from Iran, Iraq, Syria, Yemen, Libya, Somalia, and Sudan. This university’s mission of “global engagement” received Court sanctioned parent-like protections. In logic, this constitutes a mistake of category. I’ve never heard of a vulnerable “mission” that requires parental protection. People, not things, require protection against harm. Don’t judges—even if Sharia-compliant—follow logic? Universities funded by American taxpayers might try doing some local engagement. You don’t need a visa to visit Washington State from West Virginia. Despite the disconcerting push by neoconservatives in the Trump administration to conflate the Iranian people with their government, and to lump them with the rest in the Ban—you should know the following: Iranians are well-represented in our state’s high-tech industry as top talent (PhD's galore).